We have been running into an issue with some terminal servers we have running Server 2016 where the NIC just drops off. 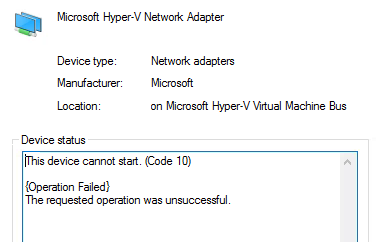 These are Hyper-V guests running on 2016 Hyper-V and eventually (after about 2-3 months) the "Microsoft Hyper-V Network Adapter" just fails with "The device cannot start. (Code 10)". Restarting doesn't make it work and safe mode doesn't make it work. The only way to make it work again is by updating the driver and manually choosing the same driver that is already applied and letting it basically reinstall the same one. Strange this is this is only happening on a set of VM's that are cloned from a master image using Citrix MCS, but these are also the only VM's that are 24/7 and more heavily used, have folder redirection, etc. What is the process to try to create some sort of dump like a process dump to try to see why it failed in the first place with a Code 10? The event logs come up empty and even on the hypervisor we can't find anything relating to this problem. The driver version is 10.0.14393.2273 which our other VM's don't have an issue with even on the same hosts. So I'm confident that this is related to the VMs and not the hypervisor. Browse other questions tagged networking hyper-v drivers adapter or ask your own question. Local disk recomendations for Hyper-V 2012 nodes? Is there any software for driver maintenance?